Cabo Pulmo National Park (CPNP), situated at the southern tip of Baja California Sur, encompasses a unique coral reef environment - the only one in the Gulf of California and the northernmost example in the Eastern Tropical Pacific (Figure 1). In 1995, the marine environment was officially decreed a natural protected area. The formation of the CPNP changed the way in which local marine resources are utilized from consumptive and commercial exploitation to recreational use. However, local and distant users still depend upon this common resource base for the generation of income and food, and scientific investigation and research. At the time of my research nearly a decade later (2003), however, CPNP lacked the long-term management and protection necessary to ensure the protection of the coral reefs and livelihoods. Interested in contributing to social science research on marine protected areas (MPAs), my doctoral studies were focused on measuring the importance of MPAs on local livelihood security and well-being. As such, I used a political ecology approach to understand user variability in terms of livelihood systems. My research asked how and why user livelihoods and well-being were shaped and transformed by the establishment of the MPA. I also asked how marine resource health changed in relation to people’s use of the reef to meet their desired levels of well-being and community conservation objectives. I used CPNP as my case study. One finding from my research was that local users alone can neither be held accountable for the deterioration of the natural resource base at CPNP nor the current status of the MPA. The following is a brief history of the establishment of CPNP and its’ aftermath from a political ecology perspective. It suggests that the combination of Mexican national political and economic agendas for commerce, tourism, and protected areas have been factors in the outcome of the MPA. During the 1920s and 1930s, the local coastal fishers continued to harvest scale fish for household consumption and trade but also began small-scale exploitation of a series of specific fisheries in reaction to the changing demands of the national and international market. At first, the pearl fishery was important, as the area was described as supporting an abundant quantity of superior species as compared to elsewhere in the Gulf. At the time that this fishery collapsed in the early 1930s, the market for commercial shark-fishing was developed, largely due to demand for shark liver during World War II (Interview 74, Interview 73). After 1941 the market for shark liver declined as the vitamins derived from it were synthesized. Shark meat (salted and dried for sale in Mexico) and fins (dried for export to Asia) maintained its importance until sharks were overfished in Cabo Pulmo by 1980s. Long important for subsistence and trade, a new commercial market in sea turtle skin and shell followed after the collapse of the shark liver industry (Interview 73). In the early days, turtles were plentiful: “Turtles were so thick you’d have to steer around them” (Interview 91) “One fisher could easily spear seven a night which was as many as the wooden row boat would hold” (Interview 75), and “For every one turtle spotted today, four or five hundred were spotted in the 1950s” (Interview 73). Regulation of sea turtle captures began in 1972 when the Mexican government required turtle permits, followed by international protection when the species was listed as endangered in the Gulf of California (by US Endangered Species Act and Mexican Law in 1990). Interviewees noted how artisanal and commercial boats still come to East Cape to harvest turtles. Reef fish and Pacific red snapper, locally called hauchinango, have always been part of the subsistence and commercial market. Haucinango remains one of the most desirable export fish. Due to the geographic isolation and primitive infrastructure (no refrigeration) of the Cabo Pulmo area, as well as the simple fishing technology (e.g., wooden row and sail boats, hook and line), the contribution to the national and export market is small. The 1970s marked a change in the way the marine resources were used at Cabo Pulmo, mainly due to national policy expanding the country’s inshore fisheries. The government expanded the fishing effort in Baja by encouraging the formation of new fishing cooperatives (many formed by Cabo Pulmo fishermen) and modernizing the artisanal fishing sector through subsidies and infrastructure in coastal communities (see Young 2001, 1999, and 1995). The outcome was increased mobility of commercial fishermen and migration between coasts of Baja to take advantage of expanding market demands, with fishermen following the seasonality of fish migrations. The paving of Highway 1 in 1973 eased access to Cabo Pulmo and opened a new market for the local fisherfolk via the arrival of the ice truck from La Paz. The harvest of fishing at Cabo Pulmo intensified with the introduction of new, more efficient fishing technologies, the growth in commercial fisheries throughout the region, and the massive influx of small-scale fisheries. By the 1980s, many of the country’s marine resources had become economically important commodities, though largely unregulated. The state’s fishery underwent a further expansion based on market and trade liberalization and national/foreign private investment in the open sea fisheries. Distant commercial fleets fishing for sardine, shrimp, and tuna began fishing both legally and illegally along the Baja coast (NOAA 2003). Between 1989 and 1998, the number of pangas (small boats) fishing along the seventeen coastal states increased from 70,000 to over 260,000 vessels, targeting over 500 species (Hernandez and Kempton 2003). The industrial commercial fishing fleet is considered to have affected many important species, including sportsfish (i.e., billfish). In other reef systems around the world following the depletion of the larger, more valuable fish, harvests have ultimately shifted to trapping the smaller reef species (Nelson 2001). Fortunately, the Pulmo reef has not been a target for the live reef fish trade, with the exception of known incidences by non-Cabo Pulmo residents. While the larger fish have been exploited over the Cabo Pulmo reef, local fishers have only directly targeted reef fish for bait and subsistence, not for commercial purposes. The Pulmo reefs have not been subjected to the myriad other destructive fishing practices, such as cyanide or stun poison, that are common in other regions of the world supporting coral reefs, such as the Philippines and Indonesia. General consensus is that the impetus for establishing Cabo Pulmo as a protected area was the convergence of varying concerned user groups, including the resident Mexican community, the non-Mexican and scientific/academic communities, and sport fishing and diving industries, over the decline in the marine resources. Coinciding with user concern, there was an increase in national and international attention toward ecotourism and marine protection during the late 1980s and 1990s, which helped to facilitate the establishment of CPNP. Though tourism in Mexico was still very much characterized as a “top down” approach, in 1994 the Secretary of Tourism (Secretaria de Turisma, SECTUR) adopted a strategy for eco and sustainable tourism. During this time, CPNP experienced an increase in eco-based tourism for diving and sport fishing in the region. The early 1990s are also a watershed for marine protection in the Gulf of California with the decree of the Biosphere Reserve of the upper Gulf of California and Colorado River delta. This was marked by a flurry of global and ecological awareness that led to the proliferation of international environmental agreements and interest in natural resource protection within Mexico. NGOs and international government agencies started playing an important role in managing natural resources by providing the financial support necessary for conservation projects. When Cabo Pulmo was decreed a National Marine Park in 1995 it was the only officially protected coral reef on the continental Pacific coast of Mexico (Reyes-Bonilla 1997). Within two years of CPNP being established, the Secretariat of Environment and Natural Resources (Secretaría del Medio Ambiente y Recursos Naturales, SEMARNAT), Mexico's environment ministry, initiated three actions that gave the appearance that CPNP was not going to be just another “paper park,” including the creation of a board, an established advisory community, and a management plan. However, an approved management plan never materialized. In addition, CPNP remained largely absent from the national and international protected area and coral reef programs, and did not receive technical and financial support from international non-governmental agencies, with the exception of Pro Peninsula. In contrast, many of the other natural protected areas that include some portion of the marine system now had approved management plans and structured authority, including Parque Marino Nacional Bahía de Loreto (1996), Parque Nacional Bahía de los Ángeles (1990) and Isla Espiritu Santo (2003). The people of Cabo Pulmo-East Cape were left with the responsibility for developing the regulations and planning for the security of the national protected area. Extra-local institutions and policies have had a great effect on the local resources and livelihoods at Cabo Pulmo and the success of the MPA. First, there were institutional changes at the federal level that created a transition in agencies responsible for overseeing protected areas and fisheries. The responsibility of protected areas management was transferred from the Environmental Ministry’s Secretaría de Desarrollo Urbano y Ecología (SEDSOL) (1988) to Secretaria del Medio Ambiente, Recursos Naturales y Pesca (SEMARNAP) (1994) to Secretaria de Medio Ambiente y Recursos Naturales (SEMARNAT) (2000) within CONANP. While considered an improvement, as it created an autonomous agency to lead conservation efforts in Mexico, the process of establishing the new agency demanded federal restructuring and reorganization that may have interfered with the review of CPNP’s management plan. SEMARNAT was also given new responsibilities such as the review of environmental impact statements and granting standards and permits from the Instituto Nacional de Ecología. Experts note that more problematic was SEMARNAT’s new responsibility to oversee both the protection of the environment as well as the development of the country’s natural resources (in accordance with Article 27 of the Constitution) (Gonzalez and Gastelum 1999). The organizational changes demanded that modifications be made to the associated environmental legislation. The Ley General del Equilibrio Ecológico y la Protección al Ambiente called for the re-categorization of previously decreed natural protected areas into the new system of eight categories. This led to the removal of National Marine Park as a category and the modification of Cabo Pulmo’s status from National Marine Park (1995) to National Park (2000). Another problem was the fast turnover rate experienced by highly placed people in the Mexican government (ministries, sub-ministries and general directors), as once a management plan is technically approved by SEMARNAT the political consensus among agencies is necessary for the signature by the president. The result of the Department of Fisheries (CONAPESCA) removal from SEMARNAT was a national fisheries policy and national protected area disconnect. Fisheries management and protected areas are now housed in two separate federal branches: Department of Fisheries (CONAPESCA) in La Secretaría de Agricultura, Ganadería, Desarrollo Rural, Pesca y Alimentación (SAGARPA), which oversees agriculture and livestock, and National Protected Areas (CONCAP) in SEMARNAT. CONAPESCA has been criticized for it’s poor fishery regulations and treatment of the seas as mainly the “de facto” property of commercial fishing interests (Beltran et al 2002). This, coupled with SEMARNAT’s limited budget for enforcement and scientific fisheries, makes the management of Mexican fisheries and protected areas difficult (Interview 149). A third factor is the conflict that seems to exist between protected areas conservation and tourism development. Baja California Peninsula may need economic development and tourism to provide a valuable source of income, but often comes at a cost to biodiversity. An excellent recent example surrounds the controversial development of the Nautical Ladder, Escalera Nautica, which was proposed by federal National Fund for Tourism Development (FONATUR) in the early 2000 (see Dean and Pesenti 2003, Pesenti and Spalding 2003, and Millman and Carlton 2003 for a detailed discussion). 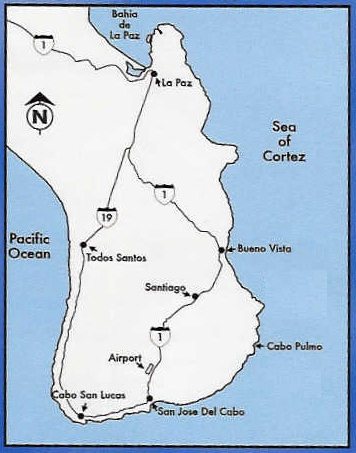 The mega-development project, which calls for the establishment of twenty-two full-service marinas on both Baja California coasts and the mainland side of the Gulf of California, an 84-mile highway to tow boats, road improvements, renovation of ten existing airports, development of over thirty golf courses, among other infrastructure developments, has the potential to negatively affect the biodiversity of the region as well as impact several protected areas, including: the Biosphere Reserves of Islas del Golfo de California and Alto Golfo and El Vizcaino, the National Parks of Bahia de Loreto and Cabo Pulmo, and the Area of Protected Flora and Fauna of Valle de los Cirios (Dean and Pesenti 2003). More recently, Cabo Pulmo was part of the plan for a massive resort complex, called Cabo Cortes, on a scale comparable to Cancún, until Mexican President Felipe Calderon rejected it. Even so, Los Cabos, located 40 to 60 miles to the southwest of CPNP, has been transformed into the country’s fasting growing city and tourist destination, receiving 66% of all Baja California tourism in 2000 (Herrera-Ulloa et al. 2003) and has the potential to spread to CPNP. Since CPNP only encompasses the marine environment and SEMARNAT only has federal jurisdiction to the high tide mark, there is no resource management authority over the adjacent terrestrial system. In response to the establishment of the protected area and the rise in eco- and adventure-based tourism, a new economic sector of tourist related businesses is growing and maintaining the resident community’s high dependence upon the use and conservation of CPNP as of 2003. The short and long-term objectives of the community and government (fisheries, tourism, and land development) must be addressed to minimize trade-offs between reef condition, social well-being, and national growth. In addition, MPA evaluations should take into consideration user group variability among livelihood systems, and the factors (i.e., resource endowments, political power, and extra-local forces) that influence whether or not a livelihood is able to respond and adapt favorably to a change in marine tenure. Pamela Weiant runs a consulting business for natural resource planning and management (with a focus on oceans), Strategic Environmental Planning (StEP). For more information on the methodology utilized or the results from the livelihood analysis and coral reef monitoring, please feel free to email Pamela at pweiant@gmail.com. Interview 73. Local Expert #2, April 5, 2003. Interview 74. Local Expert #3, May 15, 2003 and May 31, 2003. Interview 75. Local Expert #4, May 31, 2003. Interview 76. Local Expert #5, October 2, 2003. Interview 91. Local Expert #3, June 3, 2003. Interview 149. Government and Academia, September 25, 2003. Beltrán L., Ortega-Rubio A., Lagunas M., González H., Soto M. and M. Acevedo. 2002. Environmental, economic and social effects caused by NAFTA in the fishery food companies of Baja California Sur, Mexico. Sustainable Development 10: 215-222. Dean K. and C. Pesenti. 2003. Sustainable Coastal Development, The Escalera Náutica, A mega-tourism project on the Baja California Peninsula. www.propeninsula.org. Gonzales G. and M. Gastelum. 1999. Overview of the environmental laws of Mexico. Nacional Law Center for Inter-American Free Trade. 10 p.
Hernandez A. and W. Kempton. 2003. Changes in fisheries management in Mexico: effects of increasing scientific input and public participation. Ocean & Coastal Management 46: 507-526. Herrera-Ulloa A., S. Lluch-Cota, H. Ramírez-Aguirre, S. Hernández-Vázquez, and A. Ortega-Rubio. 2003. Sustainable performance of the tourist industry in the state of Baja California Sur, Mexico. Interciencia 28(5): 268-272. Millman J. and J. Carlton. 2003. Big dreams for Baja. Wall Street Journal, 1/15/03. Nelson R. 2001. Thoughts and notes on the Sea of Cortez. Prepared for Sea Watch. [online] URL: http://www.seawatch.org/nelsonpaper.htm. NOAA Southwest Regional Office. no date. Appendix A, Fishing effort in the Pacific Ocean. 362-372. [online] URL: http://swr.nmfs.noaa.gov/appendices.pdf. Last modified 3/11/05. Pesenti C. and M. Spalding. 2003. Marinas development threatens Baja California surf breaks. Making Waves. Reyes-Bonilla, H. 1997. Cabo Pulmo Reef: A new marine reserve in the Gulf of California. Conserv. Biol. 11(2): 838. Young E. 2001. State intervention and abuse of the commons: fisheries development in Baja California Sur, Mexico. Annals of the Association of Am. Geog. 91(2): 283-306. -----1999. Balancing conservation with development in small-scale fisheries: is ecotourism an empty promise? Human Ecology 27(4): 581-619. -----1995. Linking local needs to nature protection in the coastal lagoons of Baja California Sur, Mexico. Austin: The University of Texas - Austin. 314 p.